After the International Triathlon Union’s (ITU) two-year Olympic qualification period officially ended last week, ITU yesterday began notifying the National Olympic Committees (NOCs) and National Federations (NFs) of the number of spots each has qualified on women’s and men’s start lists at London 2012. In all, a record number of 39 NOCs had qualified spots at the triathlon competition for London 2012, the highest number ever for triathlon at an Olympic Games. In Beijing 2008, there were 36 NOCs that had qualified positions. Prior to that, there were 33 in Athens 2004 and 34 in Sydney 2000, although in those Olympics, there were 50 women and 50 men on the start lists as opposed to 55 now. Among the 39 NOCs this year, five have qualified a spot for the first time in the history of triathlon at the Olympic Games, including: Ecuador, Mauritius, Monaco, Republic of Korea, and Slovenia. Only eight NOCs were able to qualify the maximum of three women and those are: United States, Australia, Great Britain, Japan, France, Germany, New Zealand and Spain. The eight NOCs that have qualified the maximum of three men are: Great Britain, Germany, Russia, New Zealand, France, Spain, Australia, and Canada. 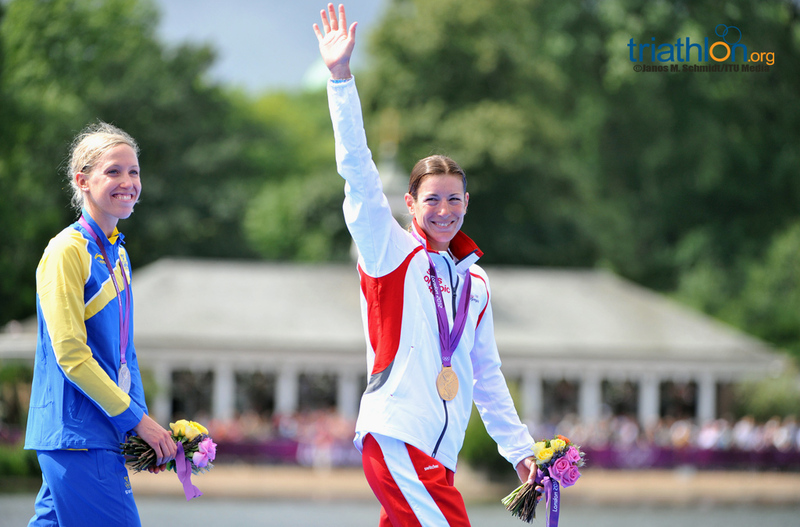 A total of 55 women and 55 men will compete in triathlon at this summer’s Olympic Games with the women’s competition set for 9:00am on Saturday 4 August and the men’s at 11:30am on Tuesday 7 August, both at Hyde Park. Following the announcement of the Olympic places, the respective NOCs will select which athletes will represent their country at the London 2012 Olympic Games. Madrid’s 2010 ITU World Championship Series race opened the ITU Olympic qualification period and last weekend it was also Madrid that marked the final chance for athletes to score points for an elusive London 2012 spot. At that final qualification event in Madrid, reigning European Champion Nicola Spirig of Switzerland neatly wrapped up the Olympic qualification period with another victory after claiming the Madrid title in 2010. In the men’s race, Great Britain’s Jonathan Brownlee continued his devastating form with another masterful performance to record his second straight victory in the 2012 ITU World Triathlon Series. Great Britain's Jonathan Brownlee made it two from two to start his 2012 ITU World Triathlon Series, as he put in an incredible all-around performance to beat Alexander Bryukhankov and Dmitry Polyanskiy in Madrid.